More pages than the standard editions of FF! Special Edition #1 of The Fantastic Fifties, featuring Peplum and "Mighty Sagas of the World's Mightiest Men." 80 pages. Perfect bound, full-color glossy magazine. 80 pages plus cover. Special Edition #1 2017/2018. Hemlock Publishing. For mature readers. Collectors Note: Brand new and uncirculated, received directly from the publisher in the UK. 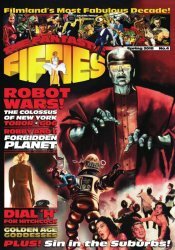 We also carry back issues of Fantastic Fifties regular 64-page editions and the special 80-page editions.